Imagine walking around a bustling shopping and commuting thoroughfare just outside Amsterdam’s ring of canals. You pass Dutch bakeries, Shoarma houses, Surinamese restaurants. Ah, the sweet, sweet scents of an international city. Suddenly, your nostrils pick up something not so … sweet. Or, shall I say, sweet in another way. Is that … manure? You look down quickly to make sure you didn’t step in anything. Nothing there. No carriages passing by, either. What is that? Following your nose, you turn down a side street. It’s a quiet street, and just beyond there’s greenery—a park, possibly. Ah, that must be the source. You continue walking down the cobblestone walkway, admiring the old and exclusive row of homes. Nice, very nice. One of the facades, though, doesn’t look like the others. It’s more of an arch with large wooden doors. Hmm. Interesting. And … there’s that “sweet” scent again. 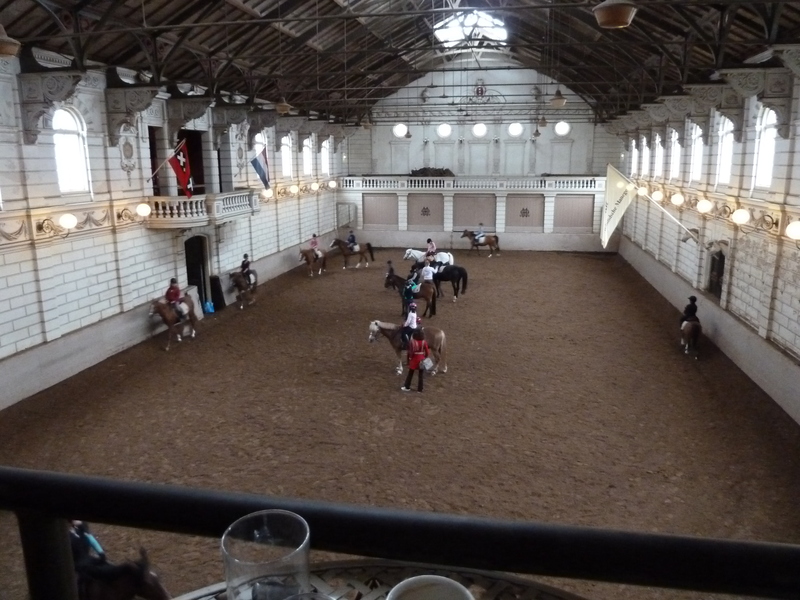 You have stumbled upon the home of the Hollandsche Manege, Amsterdam’s oldest riding school, established in the 1770s. This building dates from the 1880s is, luckily, open to the public—as long as they are quiet, of course. 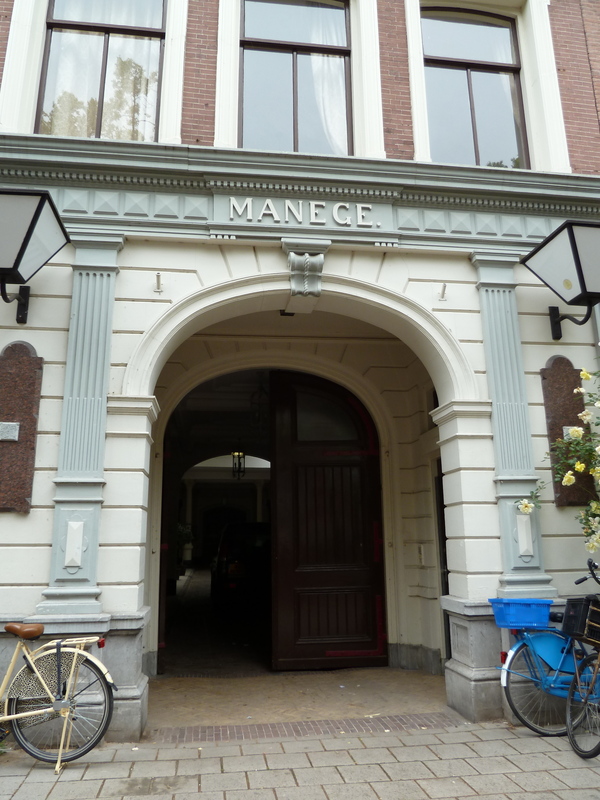 I admit, I did not stumble upon the manege. My Amsterdamster friend brought me by knowing I’d love this hidden nugget. Open the doors and there’s a long low-ceiling, cobbled entry leading to a large, vaulted arena. Peer over a 4- to 5-foot tall wall any time of day, and you’re likely to find a riding class going on, or also the “adult swim” version of riding. But wait, there’s more. 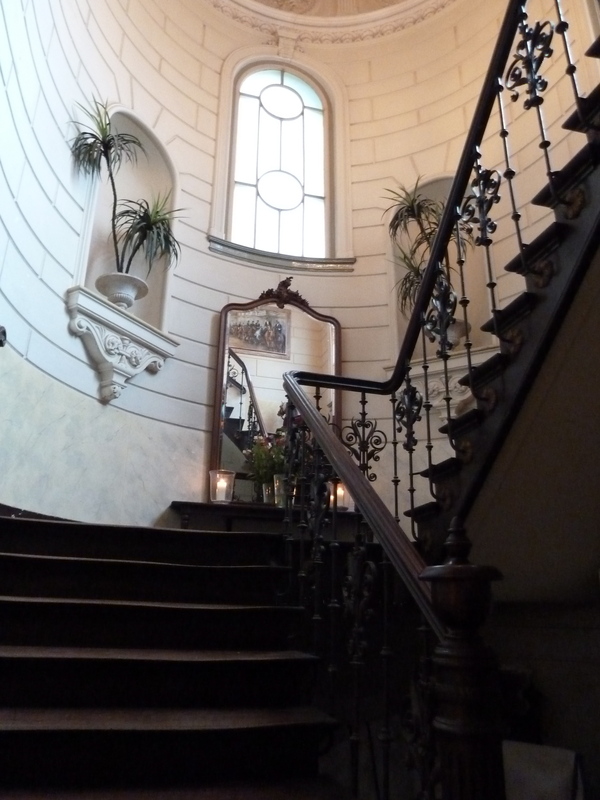 Walk through a door to the right and walk up an elegant staircase. Yes, it’s elegant. Really. On the staircase you get a sense of not only the history of the place, but of the generations that have come here to ride: Each rise is heavily worn. The destination? A small cafe with a patio overlooking the ring. 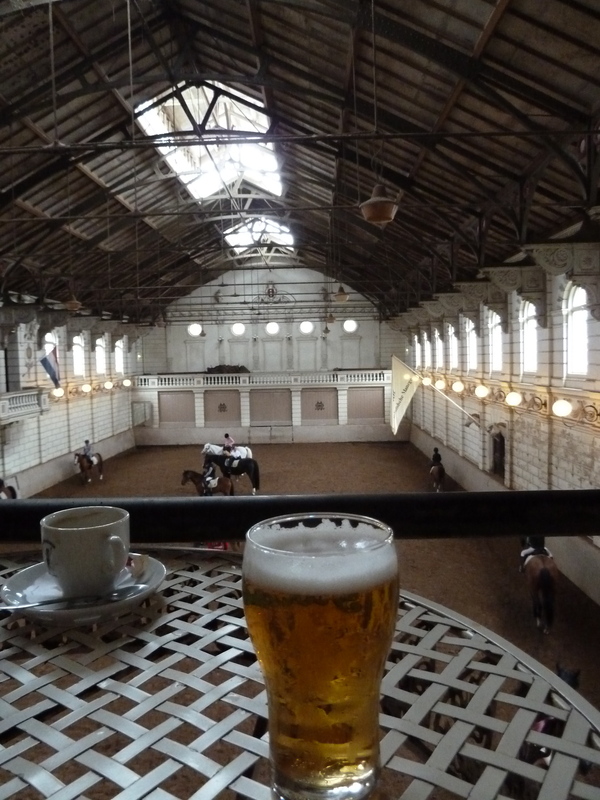 And look at this: You can even enjoy a coffee, beer or aperitif while waiting for your daughter to finish her riding lesson. How civilized. They give alcohol a tasty, refreshingly clean kick in the pants. And, best yet, they can be made at home – no distillery needed. That’s brilliant! Not that I’ve made ‘cellos, of course. But they’ve been given to me, as recently as this past holiday. It was a double gift – lemoncello and a blog post in the making. I like that. During our New Year’s festivities in Provincetown, where 11 compadres destroyed convened on our friends’ home, Karen gave out a bottle of the liquor – made in her very own kitchen – to everyone in the crowd, with a spare to give New Year’s Eve a celebratory kick start. Karen made both lemoncello and orangecello. 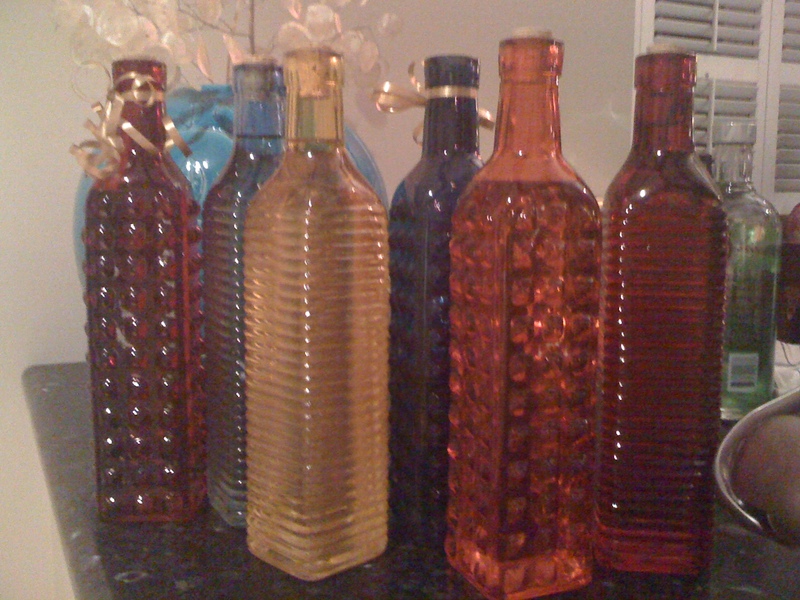 Which bottles contained what? The ribbed bottles were filled with one flavor, the bumpy bottles had another flavor. *A simple simple syrup recipe: Boil together 1 cup water and 1 cup white sugar until sugar is dissolved. Cool. You’re done. Make more or less depending on how much you need. Keeps for a few days in the fridge. You are currently browsing the aperitif category at The Dainty Dot.